I’m going to suggest there is a simple possible atheist’s interpretation. Philosophically based certainly, but with a practical value. A possible answer both to the measurement problem and the great unanswerable question of consciousness above. So here’s a very quick explanation of the double slit experiment. Or if you’re familiar with this, skip past it here. What’s the big deal with the double slit Experiment? 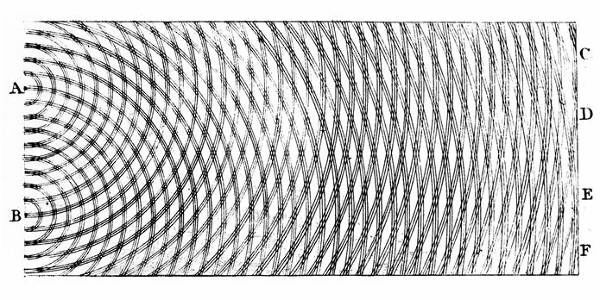 This is an experiment from classical physics devised by Thomas Young in 1801 that demonstrated light travels in waves not straight lines. Position a suitable light source behind a shield and shine a light straight through a rectangular shaped slit to a screen beyond and you will see a rectangle of light at the other end, with some fading out around the edges because the rectangle is not in sharp focus. Add a second slit close by and common sense suggests you’ll see two rectangles. Instead you actually get multiple rectangles on the screen, the ones in the middle are brightest, the rectangles getting weaker away from the middle, with bands of light and dark between them. This interference pattern is because light doesn’t travel in a straight line, but in a wave so the two streams of light effect one another as they head for the screen, generating a distinctive pattern of interference. From the 1960s physicists have repeated this experiment at a microscopic level and the results were surprisingly not a scaled down version of the classical experiment. To do a quantum version, individual electrons, individual particles are released, again heading through one or two slits. At the other side there is a light sensor logging each particle’s arrival by computer. If you fire enough particles through one at a time you’ll build up a pattern on your monitor revealing the paths the electrons have taken. With one slit open, the electrons form a single rectangle on the sensor. With two slits open and firing an electron through each slit at the same time, the monitor will create a similar interference pattern as with a standard light source described above. As with two beams of light, the electron going through slit 1 travels in a wave and so effects the path of the electron going through slit 2, and vice versa. So far so good. Everything is as the laws of classical physics predict. I should add here there is the complication of Wave Particle Duality stating light can exhibit properties both of a wave and a particle. That was a theoretical possibility predicted by Einstein and later proven by quantum experiments. However for the purposes of everyday life and classical physics, Young’s experiment proved that light travels in waves. So now the quantum weirdness starts! Repeating the experiment with slightly different conditions produces two results that have proven very, very hard to explain. Firstly, if you fire solitary electrons through slit 1, with slit 2 left open and no particle travelling through slit 2, you would expect to see a single rectangle of dots coming up on the monitor, to match the shape of the slit they are being fired through. But what you actually get is the interference pattern. There was nothing to interfere with those electrons – no second electron, no second particle stream, and yet those individual electrons have behaved as if there were. The solitary electron appears to interfere with itself. And here’s a video of this happening. Secondly if you repeat these conditions – two slits open and firing one electron at a time – and introduce a detector in the electron’s path, attempting to measure what the electron does before it reaches the other side, the result changes again. The particles go back to landing in a rectangular pattern, this time without wave pattern interference. The first case is weird enough. This second result calls into question the basis of scientific method to date – we expect the Universe to behave as an objective mechanism that we can observe and catalogue. We expect our experiments will achieve reproducible results by simply eliminating unwanted influence from the process. Yet however carefully we try to measure the electron, no matter how objective it seems our measurement should be, the very process of measurement changes the electron’s behaviour and calls into question whether we can always study our world objectively. This is especially the case when you know repeating these conditions with the detector left in place but switched off creates the interference pattern again. There are several explanations, or rather interpretations of all this weirdness, The many worlds interpretation is probably the best known – the electron takes all possible routes simultaneously because there are an infinite number of parallel Universes. But it’s not universally accepted. Why are there conscious beings in an inanimate world? To attempt an answer Dr Al-Khalili’s opening question requires some idea of what human consciousness is beyond philosophy and theology. The scientific answer should perhaps come from studying the brain. Yet although the field of neuroscience is making incredible discoveries about the workings of the human brain, a neuroscientist cannot tell you what consciousness actually is. The work on lateralization of brain function pioneered by Roger Sperry in the 1960’s and 1970’s is worth a mention here. Experiments have shown left and right hemispheres dominate different neurological functions, which became popularly understood as our being left-brained and right-brained; left-brained being analytical, logical, calculating, concerned with past and future, generating the sense that I am different from others and everything around me; and right-brained being experiential, emotional, risk-taking, concerned with the present moment, generating a sense I am part of everything around me. Of course that’s a simplification and there are plenty of exceptions. The left hemisphere dominates language processing in most people, both left and right handed individuals, but not everyone. In cases of neurological damage, the brain is occasionally able to shift some functioning from the damaged hemisphere to the undamaged. The reason I have raised lateralization here is because people usually think of the brain as one unified physical structure, and to call it ‘the brain’ suggests so. It is in fact two separate hemispheres with the Corpus Callosum in between. By some measures the human digestive system could even count as a brain. So the question is which brain should we study to find consciousness? The left-brain? The right-brain? The two hemispheres together? With or without the Corpus Callosum? Or perhaps we should study the brain in your belly? As western civilisation developed, humans swapped an Animistic understanding of the trees, mountains, animals and other stuff that surrounded us, for the Judeo-Christian understanding that only humans have souls. The dominant view became God had taken us and only us over that threshold of animal consciousness into the realm of moral beings, so for most of western history the only consciousness worth examining was human. Recent studies on animal consciousness are rapidly broadening out our expectation of where to find intelligent consciousness, the subject of a separate post. My point is simply that our basic understanding of what it is to be human – to be an animal possessed of a self-aware consciousness – is still partly influenced by thousands of years of religious and cultural history. The predominant view, that human consciousness is in a distinctly different category from consciousness in the rest of the animal kingdom, is partly a result of our cultural context. Our concept of consciousness starts with a certain bias, as we are largely tied to the assumption that anything we might call consciousness can only be located within a brain, almost certainly a human brain. At the other end of the scale, the measurement problem underlines we are not simply conscious beings interacting with an objective material Universe – human existence is more than that of an actor playing a part on a lifeless stage set. The Universe is not simply a collection of ‘dumb matter’. But we come up against the same problem. All animals including humans are composed of the exact same molecules as the rocks, the soil and the rest of the material world around us, and yet we and other animals have consciousness whereas the vast majority of stuff around us does not. Now to the second question – accounting for the measurement problem. Before reading this, please try to forget all the new age waffle you’ve ever heard about quantum physics. The innate weirdness of quantum physics gets invoked as evidence for everything from UFO’s to past-life regression, so any thought experiment or discussion involving quantum physics outside of what has already been proven is likely to get lumbered with some of that baggage. Many new age interpretations suggest our Universe only exists in the mind, which is a point of view with little practical value and quickly leads to a black hole of solipsism. For a moment, limit your consciousness to what occurs in the quantum double slit experiment and consider one possible explanation for this very specific event: What if, when the electron heads off on its own through slit number 1, it has some ‘awareness’ slit number 2 is open and could be the path for another electron, and so wobbles as in a waveform that creates its part of the interference pattern? What if it does this because that is how electrons are likely to behave when there is an adjacent electron passing through the second slit, and will do so regardless of whether there actually is an adjacent electron? And then consider if the electron did have some awareness, i.e. a base version of what we call consciousness, then maybe consciousness – whatever that may be, is present at the subatomic level. That makes it one of the basic building blocks of the Universe along with energy and matter. So the measurement problem is not a problem at all, because trying to measure the electron’s path has introduced an additional force of consciousness as surely as if energy or matter had been introduced, both of which we would expect to influence the electron’s path. Turn the detector off and you remove that force of consciousness. Essentially the electron has just enough awareness of the measure’s presence that its behaviour changes to suit the circumstance. Regardless of what the imagined consequences might be if what I’ve just said were true, ask yourself which is more logical? That a) consciousness – whatever that may be, is a fundamental building block of our Universe, found in every molecule that makes up the material world including our bodies and brains. Or b) molecules without any awareness spontaneously arrange themselves into a human body and brain, reaching a threshold where consciousness either pops into existence or is afforded the brain as a portal to pour through and interact with the world? Surely the first is far, far simpler? The second suggests either a dualism of mind and body, as consciousness would have to have come from somewhere. Or if we instead say consciousness can spontaneously appear from nowhere, isn’t that getting something out of nothing, a very unscientific answer to any question? Call it proto-consciousness or consciousness potential or something similar if you find the word consciousness has specific connotations for you. Whatever the label, a starting point that subatomic particles contain a degree of awareness that permeates the entire natural world, is a simpler explanation to work with. And in the long run simpler explanations are more likely to be proven right. As I’m not a physicist I have the luxury of being able to write this post without being accused of going outside of my chosen field. And if you’re thinking consciousness is really nothing to do with physics, then why does Dr Al-Khalili ask that question at the end of a major three part series on the atom? Is Dr Al-Khalili going out of his realm in asking the question – or only doing so if he attempts an answer? The effect of consciousness is found in the measurement problem and is holding back science. Consciousness has to be accounted for at some point. Look at it from the macroscopic end. Everything that we already know has consciousness, humans, dogs, monkeys, tends towards certain patterns of behaviour. And just as we have an idea what to expect from humans and animals as beings with some awareness of their world, we can expect electrons under certain conditions to tend to behave a certain way, whilst also recognizing sometimes they will do things that surprise us. That is the nature of consciousness. Just as we talk of human nature, dog nature or monkey nature as a shorthand for a collection of expected behaviours, it could be helpful to talk of electron nature. What is between the animals and the electrons? Recognizing a basic property of awareness at the smallest level does not entail a return to Animism or any other religion, although Animistic societies would surely have done less damage to this planet than our supposedly rational society is doing now (is there anything more illogical than a species rapidly destroying its only available life support system?). In short there is no need to start worshipping tree spirits or rock spirits. Talking to a sapling will not raise its self esteem so that it grows into a mighty Oak tree. Neither does a rock silently scream in terror when I throw it. Why would it? It’s a rock! Unlike an animal where the animal consciousness depends on the animal body to continue in that form, whatever awareness might be present in the atoms a rock is composed of does not depend on the rock remaining as it is and not being broken into pieces. It is only human interpretation that labels this rock a distinct entity from that rock. Unlike a human or an animal, a rock has no identity and no interest in preserving its current physical state. We don’t recognize consciousness at the smallest level because our concept of consciousness assumes it only occurs where there is a brain/body pairing as with humans and animals, and is therefore only an area of enquiry for neuroscience. I am not suggesting there is a sensory apparatus feeding back to an electron’s brain and influencing its behaviour. That presumes all consciousness is the same as animal and human consciousness. Nor is the electron some kind of sub-atomic plankton floating in a cosmic ocean. I’m saying, view consciousness as similar to mass – wherever there is energy and matter, whatever the time, whatever the place, we can expect to find the building blocks of consciousness. Bring enough atoms together to form cells, enough cells together to form an animal, and there is no need to look for the moment consciousness gets injected into the physical body – it’s more logical for it to be there from the beginning of the process in some base form. When you die your consciousness does not continue after death – I personally do not believe in an individual soul. To me my identity as an individual self is no more lasting than my individual physical body. But neither does consciousness just disappear into nothing. Just as the atoms and the energy you are made of don’t disappear, they simply change state and location. Of course the idea consciousness is a building block of the Universe is nothing new. Mystics of all religions have been saying so for thousands of years, and I’m aware this post is rather like saying “God is in everything” (I am not. I don’t personally believe in God1). The statement “God is in everything” is useful for a theologian but not for a scientist. The question is, is what I’ve described just a philosophical exercise or could this explanation be useful for humans now? Could it add something of practical value to science? And I believe it could. If the best explanation for the strangeness of the double slit experiment is the parallel Universe view, then everything, absolutely everything is possible. There are an infinite number of parallel Universes where all possibilities are played out, of which we inhabit just one – very hard to account for, and very, very hard to predict. Seeing consciousness as a building block of the Universe, on a continuum with energy and matter, does at least give us a starting point for the expected nature of that consciousness and how it’s likely to manifest in a given circumstance. Just as a dog left to its own devices in a forest will tend to behave differently from a dog being taken for a walk in the same forest by its owner, the nature of electrons and the rest of the particles that make up our Universe will have a tendency to certain patterns of behaviour, which includes being effected (or even affected) by another consciousness. If consciousness is looked at only in terms of neuroscience or philosophy or quantum physics, then Dr Al-Khalili’s question must remain unanswered, because each discipline has limits on what it can describe and a definition of what lies outside of its realm. The very word ‘discipline’ entails limits. Personally I’ve always believed it unlikely theoretical physics will ever describe the laws governing all states of matter and energy in all circumstances. Theoretical physics and mathematics use languages, composed of symbols which differentiate one thing from another, and so are finite. No finite language can ever fully describe the Nature of a Universe which is probably infinite – it’s like trying to divide a number by zero. Even though the language of mathematics possesses an infinity symbol, it’s only ever a symbol for the concept of infinity in the mind of the person using the formula. However I’m not in any way suggesting theoretical physics is not worth pursuing. Only the expectation that it will ever be a complete description of our Universe seems unlikely. Just as an Ordnance Survey map will never give you a 100% accurate representation of the topography of the lake district, if you use it properly it is close enough to reality to stop you going round in circles. And even if it were possible to create the perfect OS Map at some point in the future, it would immediately go out of date – the natural erosion and movement of soil is constantly changing the landscape because Nature is not static. The same applies to theoretical physics. The Universe is not static. It will keep moving the goalposts. Sooner or later the rules we write for ourselves will always be found to have exceptions. Yet both the OS map and theoretical physics are incredibly useful and sometimes beautiful things in themselves. At the subatomic level I’m suggesting we may get more answers if we try assuming consciousness is a basic property of the Universe and needs factoring into the equations along with energy and matter. Accounting for consciousness requires symbols so we can do the mathematics. Where you have energy and matter you will also have consciousness, because they are different aspects of the basic stuff of the Universe. Saying “where does consciousness come from, it’s a mystery?” is rather like saying “Where does energy come from? Where does matter come from? It’s a mystery!”. Logic suggests it is there. To see if that interpretation is useful needs someone to ‘do the Math’. In an inherently creative world it is just possible I could go to work tomorrow and find the Universe has transformed my office into a bad tempered pink Hippopotamus – I’m fairly sure there’s enough water, carbon and other elements on site required to build a disgruntled Hippo! But I don’t have sleepless nights about that because it almost certainly won’t – in ordinary life the Universe follows classical laws and works in largely predictable ways. With very little of the normal material world present, The quantum double slit experiment may be presenting us the Universe stripped back to the bare essence. And this essence emerges with the ambiguity in the experiment. We know human consciousness is stimulated by ambiguity. For example, arguably the most popular visual art movement of all time, Impressionism, came about when photography was giving artists a near perfect way to represent any object (albeit in monochrome). So apart from adding colour, why bother with the effort of producing an imperfect painting? What is so interesting about this imperfect image? What intrigues the viewer about say Monet’s Waterlillies or Poppy field at Argenteuil is the visual ambiguity. Ambiguity beyond the analytical question “how has the artistic achieved this effect?” but into the experiential “what am I looking at?” or even “who am I? Am I still the observer?”. 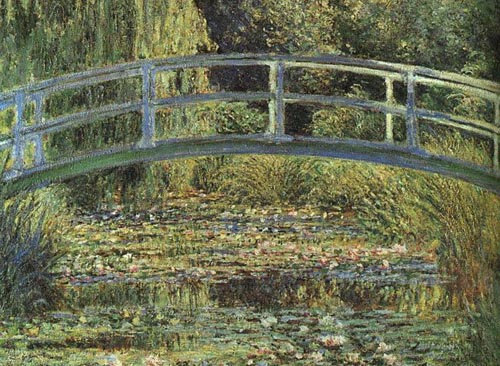 Put simply the ambiguity of Impressionism gets our consciousness going. The quantum microchip has been with us for at least 15 years and could soon revolutionise computing with previously unimaginable computing power. The paradox is that regardless of how they are made, the quantum chip’s power is due to quantum uncertainty, yet quantum uncertainty is the reason nobody can really explain why it works. The favoured explanation again comes from the parallel universe view, in that introducing uncertainty causes the qubits to inhabit all possible states at once, massively increasing the potential computing power. Another perspective would be, building a physical system that employs quantum uncertainty introduces ambiguity which frees particles to use their part of consciousness, excites it into action. The connection between a painting and a living universe does sound a bit tenuous I grant. But it sounds strange because we are used to thinking of our Universe as purely ‘dumb matter’, something experiment and reason show is not the whole story. In this post I am not claiming to have the answer to the measurement problem. I’m not saying the Copenhagen interpretation is wrong, or the parallel Universe interpretation is wrong etc etc. They are ways of getting the human mind around a counter intuitive phenomenon, with their advantages and disadvantages. A microscopic consciousness explanation, a sort of materialist or scientific panpsychism, is another interpretation worth considering and playing with. We know it’s impossible to remain the completely independent observer of nature in all circumstances. Just suppose awareness, consciousness is inseparable from energy and matter – is a property of mass – what problems might that solve? How could it be incorporated into the mathematics describing our world? I can’t ‘do the Math’ as I don’t have the training or the motivation to learn. Perhaps if you’ve read this far you are someone who can? I can only describe what is rationally and intuitively obvious to me. I’m providing the ‘soft’ answer to the measurement problem, the rational framework for it to be understood. Someone else will have to do the ‘hard’ bit and express this with equations. I’m sure many scientists will be very uncomfortable with this idea – consciousness at a subatomic level just sounds unscientific. Putting consciousness and quantum physics in the same sentence is difficult without the author appearing to be ‘on a trip’. But the logical argument is very simple. And we know observation and measurement, the application of our consciousness, changes our observations. What would happen if we were to treat consciousness as a basic part of the equations rather than noise to be eliminated? Could it advance knowledge and understanding in a way that would not be possible otherwise? Lastly I want to make a small prediction (an unintentional weak pun). Although the whole basis of this post is the weirdness of a solitary electron behaving as if another electron is travelling alongside of it, then waveform collapse happening for no other reason than it is being measured, I expect that sometime, in 10, 100 or 1000 years, the quantum double slit experiment will be repeated and electrons will be observed doing the opposite. Awkward I know. But quite possible in an inherently creative Universe. 1. The quantum double slit experiment has been interpreted by some as evidence for an intelligent creator. I have no issue with religious faith and recognize it can be a powerful force for good, although personally I don’t believe in any sort of God. Nothing in the text above adds anything to that debate – if you believe humans, animals and the rest of the natural world need an intelligent creator, then everything discovered in quantum physics must be the work of that creator. Whereas for scientists who do not believe in God there is enough in chaos theory, mathematical biology etc, to explain our complex natural world without an intelligent creator. Even so many will confuse awareness at the smallest level as being a ‘pro-God’ or religious interpretation, and therefore dismissing it. Logically they are not the same thing. The ‘argument by design’ for God’s existence; we are complex conscious beings in a complex world so must be the work of an intelligent creator should not be reversed to; because we can explain our complex world without an intelligent creator, our Universe must be without consciousness at the basic level. Taking this second point of view still does not answer the main question, how does unconscious unaware matter cross the threshold into generating consciousness? The logical deductive answer is, there is no threshold. 2. In Steve Johnson’s 2016 book Wonderland he shows how important play has been for driving technological advance. For example bone flutes date back to 40,000 years ago and have intervals, 4ths and 5ths. Cave dwelling humans had the most basic tools for survival, yet devoted time and effort to abstract endeavours like music. Is this purely a product of our species? Or is our creativity and curiosity reflecting the basic nature of a living Universe? What an extraordinary concept! Since the events of 9/11/2001, I have been dealing with issues of life and death, consciousness, and what happens after death. These are complex issues. Or maybe not. Needless to say, I have been depressed and very sad/angry as a result. After reading your thoughts on “the electron nature”, I gained an internal peace that I have not experienced in over a decade. The simple thought of consciousness in everything is just brilliant. I cannot say I have conquered my depression, but I can tell you that my anxiety and sadness towards the end of life has been dramatically reduced. Thank you so much for sharing your thoughts! Hello Nick, Thanks for your kind words. The post was mainly aimed at provoking thought within the scientific community to consider the logic of consciousness being a basic element of the Universe, and to demonstrate that is possible outside of the context of religion or New Age beliefs. But it’s good to hear it had some resonance with you. I’m not in any way aiming to be a Spritual teacher – the post was really putting into words the way I’ve long understood the way the Universe is put together, which for me reveals a significant gap in modern science. And I think it’s especially relevant now that recent experiments into animal consciousness are showing how much humans have in common with other animals. Sometimes I find a piece of information from a book or documentary which gives me a better understanding of the world, (maybe a nature documentary or something about the Cosmos) can have that sort of effect. There’s often a beauty in knowledge, and I guess whatever increases our understanding of the world also gives us a different perspective, even if only temporarily. I’m not qualified to advise on dealing with depression, but I’m sure that whatever you’ve gone through there will be plenty of people out there who have experienced something similar, even though it appears as though everybody else is doing ‘just fine’. Nice rave Matthew! I am completely with you and I am currently writing on this entire subject in my book ‘Origin’ that approaches the subject of consciousness, energy, life, purpose etc etc in a very similar way and style that you seem to have. I would love to share with you if you are interested as I feel quite excited with what is emerging as a complete explanation or rather a sound conceptual model of reality from which both relativity and quantum mechanics are derived and resolved. This being, of course, the ‘Holy Grail’ of science and the key to a ToE. But more than this, it is a work that explains how and why we (humans) emerged and perhaps most importantly why we have messed things up so much! Anyway, thanks for your beautiful and intelligent thoughts and words, and maybe we talk, maybe not but either way, enjoy!. PS, nice piano playing too. Hi Ash. Thanks very much for your comments. I’ll definitely have a look at your site when I get some time – I’ll be without internet for the next few days unfortunately, and then having to apply for my own job at work….. I’ve drafted a follow up to this article, which hopefully I’ll put up in a month or so. It’s always a good idea to walk away from writing and re-read it fresh before putting it out there! When you say ‘rave’ hopefully that’s not as in ‘rant and rave’? My aim is not to make a impassioned argument, more to point out if we look at the logical arguments for consciousness at the most basic level, it makes more sense than the current Scientific explanation for consciousness, which really boils down to “We don’t know!” (subject of the next post). When I first heard about the law of conservation of energy in High School I just applied it to consciousness, because logically and instinctively it was the most obvious next step. I wrote this post mainly because I’m surprised something logically very simple is not even considered as a possibility by most Scientists. Human knowledge is never acquired in a vacuum so there are historic and cultural factors that prevent Scientists from considering something which to me is actually very non-mysterious and matter of fact. Thanks very much for your comments Alan. If you’ve not seen it already you should find this later post interesting too, http://www.theideastring.com/concgap/. I added that to give more background about how I see consciousness operating in our Universe, which is perhaps saying nothing more remarkable than we are part of a living Universe. I think that’s an understanding people often reach through experience of meditation. The aim of both of those posts has been to consider the logical argument for that, to highlight some logical issues with there being a ‘dumb matter’ Universe into which consciousness suddenly appears and disappears, and especially in light of the recent experiments into the intelligence of other animals. And if you’re on facebook or other social media, please give them a share. I’m not writing to make money, but like any author I like my work to be read as widely as possible!